IF a good preparation before Communion is so important, a good thanksgiving after Communion is of even greater importance. St. John Chrysostom says that when a person has eaten some delicious food at a banquet, he is careful not to take anything bitter in his mouth immediately after, lest he should lose the sweet flavor of those delicate viands. In like manner, when we have received the precious Body of Jesus Christ, we should take care not to lose its heavenly flavor by turning too soon to the cares and business of the world. St. Francis de Sales expresses the same idea. "When the merchants of India," he says, "have brought home their precious porcelain, they are very careful in conveying it to their storehouses lest they should stumble and break their costly wares. In like manner should the Christian, when he carries the priceless treasure of Our Lord's Body, walk with great care and circumspection in order not to lose the costly gift committed to his keeping?" The meaning of both Saints is that after Communion we should spend some time in devout recollection and prayer. This is the general practice of good Catholics. And indeed, reason itself tells us that a good thanksgiving after Communion is of even more importance than a good preparation before it. If we are required to pause and consider what we are about to do when we approach Our Lord, what should be our devotion when He is actually in our hearts? When the Blessed Virgin Mary visited St. Elizabeth, the aged Saint was astonished at the condescension of the glorious Mother of God, and said: "Whence is this to me, that the Mother of my God should come to me?" Now, in Holy Communion, it is the Lord Himself that comes to us, the Eternal "Wisdom which proceeded from the mouth of the Most High," the "Lord and Prince of the House of Israel, Who appeared to Moses in the burning bush," the "King of nations," "Emmanuel," "our King and Law-giver." To remain indifferent after having received the Blessed Eucharist is to evince either a total want of faith or a levity and stupidity unworthy of a reasonable being. What a spectacle for the Angels, to see a creature approach that Sacred Host before which they bow in lowliest adoration and, when he has had the unutterable happiness of receiving his Redeemer, leave the church with as much unconcern as if he had but partaken of ordinary bread! If indeed this should be done by one who has had no opportunity for receiving instruction on this subject, no doubt the Angels will have compassion on his ignorance, but should a well-instructed Catholic be guilty of such ungrateful behavior towards Jesus Christ after Communion, I think that nothing but the mercy of Our Lord would prevent them from avenging the impiety. St. Alphonsus relates that a priest, seeing a man leave the church immediately after Communion, sent the servers of Mass with lighted candles to accompany him home. "What is the matter?" asked the man. "Oh," said the boys, "we are come to accompany Our Lord, Who is still present in your heart. " If everyone who follows the example of this indevout communicant received the same reproof, the scandal of going directly from the altar to the world would soon cease. Although the greatness of Our Lord is a sufficient reason why we should not leave Him alone in our hearts after Communion, it is not the argument which He Himself employs. There is in this Sacrament nothing that breathes of majesty. Our Lord is silent, whether we leave the church immediately or kneel and reverently converse with Him. The stones do not cry out against our ingratitude if, after eating the Bread of Angels, we do not give thanks to God. Jesus Christ might send twelve legions of Angels to stand around us after we have left His table, to remind us that He is present in our hearts, but He does not do this. Now it is from this very fact of not surrounding Himself with anything calculated to inspire fear that we ought to draw the most powerful incentive to gratitude. This Sacrament is a Sacrament of love. In it God is pleased to treat with His creatures in all familiarity. Jesus Christ, having accomplished the work of our Redemption, draws nigh to converse with us, as He did to the two disciples on their way to Emmaus. He wishes to speak with us as one friend speaks to another. Oh then, what an affront it is to leave Him the moment that He comes to us! Scarcely to say one word to Him! Would you not consider it great unkindness if a loving friend had traveled far to see you, and when he has but a little time to stay, to leave him as soon as he had entered your house and go to attend to your business or to seek your pleasure? Would you not rather give him the best welcome you could and prepare the best room in your house and adorn it with your richest furniture; would you not sacrifice something of your time to keep him company and exchange some tokens of love before you allowed him to depart? Now, should you not do as much for Jesus Christ, who has come so far to visit you, who has suffered so many sorrows for your sake, who is thinking of you always and has given you so many tokens of His love? It is by this argument that Jesus Christ Himself prefers to incite us to make a due thanksgiving after Communion, and it is one which must have irresistible weight with every faithful heart. I feel that this point needs no further proof. I will therefore pass on to consider the manner in which we ought to make our thanksgiving. What has been said in regard to preparation is, of course, equally true here, viz., that each one is free to use such prayers as he shall find most suited to his devotion. My object is only to show in what a good thanksgiving essentially consists. Now it consists first in completing the union with Our Lord, which He has come to effect, by a sincere oblation of ourselves to Him. The moment of Communion is different from any other moment of our lives. Then we can truly exclaim, "My God and my All!" When we communicate, God Himself is present in our little hearts as our Friend and Bridegroom. Nothing can be more intimate than the union that then takes place between the Creator and His creatures. It is more like the Incarnation of the Eternal Son of God in the womb of the Blessed Virgin Mary than anything else. To her it was said, "The Holy Ghost shall come upon thee, and the power Most High shall overshadow thee. And therefore also, the Holy One which shall be born of thee shall be called the Son of God." And the same Son of God, the Holy One, that was born of the spotless Virgin, comes into our hearts in the Sacred Host. Think of all that is most beautiful and most precious in the world, of all the riches of the whole universe, of all the glory of Heaven, and you have as yet but a faint idea of the wealth of a soul that has received Holy Communion. Such a soul possesses not only earth and Heaven, but the Lord and Maker of Heaven and earth. It is a mystery which almost baffles thought. Certainly God can never cease to be what He is; He can never cease to be awful [to fill with awe-----Web Master.] in His Greatness and Infinite in His Wisdom-----our Ruler, our King and our Judge-----but in this Sacrament, as if He had nothing to think of but the soul which He comes to visit, He lavishes upon her all the riches of His bounty and reveals Himself to her in no other but the most amiable and most humble manner. Perhaps it is for this reason that He has been pleased so often to manifest Himself as an Infant in the Sacred Host, in order to show us how small He has become for love of us and to take away from us all fear. Of old it was said, Magnus Dominus et laudabilis nimis. "Great is the Lord and exceedingly to be praised. " But now we may rather say: Parvus Dominus et amabilis nimis. "Small is the Lord and exceedingly to be loved." Accordingly, we find from the expressions of the Saints that the thought which possessed their souls after Communion was admiration at the unutterable love of God. St. Mary Magdalen de Pazzi once asked a pious person after Communion what she was thinking of. "Of love," was her reply. "Yes," rejoined the Saint, "when we think of the immense love of Jesus Christ for us, we cannot think of anything else." It is related of Artaxerxes, King of Persia, that when he saw Themistocles, his dearest friend, he exclaimed, in a transport of joy: "I have Themistocles, Themistocles I have!" With how much greater joy should not the soul exclaim after Communion: "I have my Jesus, my Jesus I have! I have found Him Whom my soul loves! I will keep Him, and not leave Him!" It is not, however, enough to wonder at our Saviour's love. Love must be mutual to produce union; and we must return Him love for love. Now is the time to repay Him for the trials and tears, the shame and sorrow, the contradiction and reproach which He underwent for the ransom of our souls. They were already His by the title of creation, and now they belong to Him by the title of Redemption. We must make to Him a childlike, generous, sincere, and complete oblation. "But what," you say, "have I to offer? I am poor and indigent; I stand in need of everything. What can I give to the Lord, Who made Heaven and earth?" I will tell you. Imitate Aeschines, a disciple of Socrates, of whom Seneca relates that, not being able on account of his poverty to make such rich presents to his master as his fellow disciples did, he went out and said to him: "Master, my extreme poverty leaves me nothing to give you as a token of my gratitude; I offer you, then, myself, to be yours forever." "Truly," said Socrates, "you have given me more than all the rest." Act thus with Jesus Christ. You have no treasure to offer Him; you have no station to renounce for Him; you have no occasion to die for Him; you cannot do for Him what He has done for you, but you can give Him that which He values more than anything else-----your heart. There is nothing that gives so much pleasure to Jesus Christ as a heart truly resolved to serve Him. Give Him, then, this pleasure; offer yourself to Him to be disposed of as He pleases; to receive indifferently at His hand bitter and sweet; to serve Him with all the fervor that you can; to avoid sin and to lead a Christian life. Do this, and then your Communion will really be a Communion, that is to say, a union with God. To receive the Body of Christ is common to the good and the bad, but it is the good alone who are truly united to Him. Are you perhaps afraid to make such promises? "It is easy," I hear you say, "to make an offering of ourselves to Jesus Christ, but it is not so easy to carry it into effect." Oh, Christian soul, thou dost not yet understand the generosity of love! Did not Our Lord ask St. James and St. John whether they were ready to drink of the chalice that He would drink of, before He actually gave them the grace of Martyrdom? Did He not make us promise to renounce the devil and his works and his pomps and to live in obedience to the Christian law before He adopted us as His children in Baptism? We must first promise much, and then God will help us to do much. He comes into our hearts, not only to claim them as His Own, but to give us grace whereby we may truly make them His. After we have made an oblation of ourselves to Him, then we must immediately proceed to beg of Him the grace to fulfill that which we have promised-----and this is the second part of a good thanksgiving. There is no doubt that petitioning Our Lord for special graces should be our principal occupation after Communion. "The time after Communion," says St. Teresa, is the best time for negotiating with Jesus Christ, for then He is in the soul, seated, as it were, on a throne of grace and saying as He said to the blind man: "What wilt thou that I should do to thee?" And another great servant of God says that in the beginning of his conversion he was accustomed to employ the time after Communion chiefly in making devout aspirations, but that afterwards he devoted almost the whole time to petition, which he found more profitable to his soul. Do you wish to subdue your passions and disorderly affections? Hear what He has said: "As the division of waters, so the heart of the king is in My hands." (Prov. 21:1) If the hearts of kings are like wax in His hands, is He not able to change your heart also? Is He not able to convert you as He converted the prophet David, St. Mary Magdalene, St. Paul, St. Margaret of Cortona and a host of others? Ask Him then to destroy in you what is bad and to make you what you wish to be, to change your wavering purposes into a firm resolution to follow His example, your fear of self-discipline into an earnest desire to advance in virtue and holiness. Ask Him to change your dissipated heart into a recollected one, your unmortified heart into a mortified one, your ambitious heart into an humble one, your faint and timid heart into a brave and courageous one, your irritable and peevish heart into a mild and patient one, your sinful heart into a holy one. In the life of St. Catherine of Siena, we read of a wonderful grace that she received from Our Lord. He took out her heart and gave her His in its place. Each one of us has it in his power to receive a grace somewhat similar. Let us only ask of Jesus Christ, and He will transform us, as it were, into Himself. Pray to Him for humility, for patience, for meekness, for contempt of the world, for a lively faith, a firm hope, ardent charity; for brotherly love, for love of your enemies, for the prosperity of the Church, for the conversion of sinners, heretics and infidels; for the souls in Purgatory; for devotion to His Passion, to the Blessed Sacrament, to His Immaculate Mother; for the crowning grace of perseverance-----and He will give you all, for His Arm is not shortened nor His Love diminished. The Sacrament of the Eucharist never grows old; it is as efficient now as it was at the time of the Apostles. There is nothing necessary to your true sanctity that your Lord is unwilling to impart to you. If you are diligent in asking graces of Him after Communion, if you persevere in asking, with a real desire to obtain, you will infallibly become a Saint-----yea, a great Saint! There is another exercise of devotion which should form part of your thanksgiving after Communion: I mean Praise. It is good sometimes to rejoice; it enlarges the heart and gives it courage. "Rejoice in the Lord always," says St. Paul, "and again I say-----rejoice!" The life of men would be much happier than it is were they with a lively faith to receive Holy Communion often. How sorrowful soever you may be when about to receive, afterward you will not be without consolation. When Our Divine Saviour entered the Temple, the little children cried out, "Hosanna to the Son of David!" and shall not you sing a song of praise when He comes into the temple of your heart? Oh, how much should you rejoice! How great a thing it is to be a Christian! Where is the nation that has its gods so nigh as our God is with us? What king or emperor is so honored as the faithful Catholic? What Angel of Heaven so favored as the good communicant? "Do you not know," says St. Paul, "that you are temples of God?" Yes, indeed, each good Catholic is a true Christopher, that is to say, a carrier of Christ! After Communion, he carries in his heart Jesus Christ, the Incarnate Son of God. "All things are yours," says St. Paul; "all are yours and you are Christ's." "Exult ye who live in Sion!" Why should you take life so hard and complain of your crosses and trials and be so impatient in every difficulty? Why should you envy the rich of this world, the great and the honored?' Why should you vex yourself at injuries and groan in adversity? Why should you faint at the thought of self-denial and conflict? Are you not a Catholic? Have you not the sweet services of the Church to soothe you and her Sacraments to nourish you, her benedictions to strengthen you and her absolution to cleanse you? Have you not Mary for your Mother and the Angels and Saints for your patrons and protectors, and above all, in the Blessed Sacrament, Jesus for your Father? O my soul, rejoice and sing a song unto the Lord! Alleluia! Praise the Lord, ye servants of God; praise ye the name of the Lord from henceforth, now and forever. From the rising of the sun unto the going down of the same, the name of the Lord is worthy of praise. Who is as the Lord our God who dwelleth on high and looketh down on the low things in heaven and on earth, raising up the needy from the earth and lifting up the poor out of the dunghill, that He may place them with princes, with the princes of His people! Alleluia! Bless the Lord, my soul, and let all that is within me bless His holy name! Bless the Lord, O my soul, and never forget all He has done for thee: who forgiveth all thy iniquities; who healeth all thy diseases; who redeemeth thy life from destruction; who crowneth thee with mercy and compassion; who satisfieth all thy desires with good things. He hath not dealt with thee according to thy sins, nor rewarded thee according to thy iniquities; for according to the height of Heaven above the earth, He has strengthened His mercy towards them that fear Him; and as far as the West is from the East, so far hath He removed our iniquities from us. As a father hath compassion on his children, so hath the Lord compassion on them that fear Him. Bless the Lord, all ye Angels, you that are mighty in strength and execute His word, hearkening to the voice of His orders. O my Soul, bless thou the Lord! My soul doth magnify the Lord, and my spirit hath rejoiced in God my Saviour. For He that is mighty hath done great things to me, and Holy is His name. And His mercy is from generation to generation to them that fear Him. He hath shown might in His Arm; He hath scattered the proud in the conceit of their hearts; He hath put down the mighty from their seat and hath exalted the humble; He hath filled the hungry with good things and the rich He hath sent away empty; He hath received Israel His servant, being mindful of His mercy-----as He spoke to our fathers, to Abraham and his seed forever. Having spoken of the necessity of making a thanksgiving after Communion and shown the manner in which it may profitably be made, I must say a few words about the length of time which you should devote to It. Above all I must remark that I have no intention of putting your conscience under any law; in this point you are altogether free to consult the duties of your state of life, or even your inclinations. I know that the Saints desired to spend their lifetime in thanksgiving after Communion and felt a kind of reluctance to attend to temporal affairs after having received the Body and Blood of Jesus Christ in the Holy Eucharist. Hence, in The Imitation of Christ, the blessed Thomas a Kempis complains of the necessity of eating, drinking, sleeping and attending to temporal affairs because they interrupted his converse with the Lord and Master of his heart. But at the same time, I know that the Saints never allowed their prayers to interfere with the faithful performance of the duties of their state of life. It is very important to know that true devotion does not consist in sacrificing work to prayer, but in making prayer a preparation for work and work a continuation of prayer. Hence, then, your thanksgiving should not be longer than the duties of your state of life will permit. Father Avila used to spend two hours in thanksgiving after Mass, even when he was very busy. St. Alphonsus advises everyone to devote at least half an hour to it, if it is at all possible. But whatever time you fix upon, do not imagine that your thanksgiving is at an end when you leave the church. The best thanksgiving is to cease from sin and to remain united with God; your half hour's prayer is only to help you. to do this. You cannot remain always in the church, but you can go to your business with a recollected mind. You cannot always keep your prayerbook and beads in your hands, but you can make ejaculatory prayer to God at every time and in every place. preparation for another; thus, he constantly advanced in purity of heart and in love for Jesus Christ. Now, everyone who has but little time at his disposal can make such a thanksgiving as this, if not with all the perfection of St. Aloysius, at least with great fruit and consolation to his soul. Everyone can offer to Jesus Christ the crosses he may meet with during the day and bear them patiently for the sake of Him whom he wishes to thank. He can crush the movements of impatience, the thought of vanity, the immodest glance, the word of bitterness, the laugh of folly, the look of pride. He can, for the love of the good Jesus, be just and true, pure and obedient, pious and humble. This is the way to honor and please Jesus Christ. He did not institute this adorable Sacrament to give us a little excitement of devotion, but to make us holy. "I have chosen you," said Our Lord, "that you should bring forth fruits, and that your fruit should remain." "In this is My Father glorified that you bring forth very much fruit." Make then, Christian Soul, a good use of the precious moments after Communion. You will never fully understand how precious they are. Nothing will cause you more confusion after death than the little account you have made of the Blessed Sacrament. It is related in the Book of Esther, that one night when King Assuerus could not sleep, he ordered the chronicles of his reign to be read to him. When the reader came to the place where it was related that Mardochai, the Jew, had once crushed a wicked plot against the King's life, Assuerus asked, "What reward has Mardochai received for this fidelity?" "None at all, " they answered him. Whereupon, in all haste, the King ordered the long delayed acknowledgment to be made to his deliverer, that Mardochai should be carried in procession through the streets clothed in royal apparel and crowned with the King's crown and seated upon the King's horse, and that it should be proclaimed before all: "This is the honor he is worthy of whom the King hath a mind to honor." To you also, my dear Reader, there will come a sleepless night when mortal sickness shall tell you that death is near, and then you will look back upon your life and see many benefits for which you have made no acknowledgment. When you think of your Communions, you will say, "What acknowledgment have I made to my Deliverer who has so often saved my life?" When the two disciples at Emmaus understood that it was Jesus who had been with them by the way, they remembered how their hearts had burned as He conversed with them; so at the hour of death, you will see how precious were the graces you received when Jesus in the Holy Sacrament came into your heart. Your Communions will then seem to have been the greatest blessings of your life. The world will have disappeared, friends will have deserted you, all your past life will seem to have been a dream; but the moments when you received your Saviour will appear to you in their true bearing in eternity. If the blessed in Heaven are willing to do so much for one Hail Mary, what would they not do for one' Communion? And yet they cannot have it. 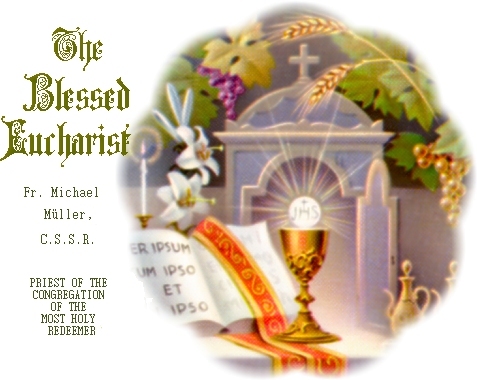 It is the privilege of mortals alone to feed on the Flesh of Jesus Christ in the Holy Eucharist. I repeat, then: make great account of your Communions. Do now what you will wish to have done at the hour of death. Make the most of every moment of your thanksgiving. Pay to Jesus Christ all the honor that you possibly can. You cannot do as Assuerus did. Jesus Christ is great and you are poor and miserable; you cannot give Him royal honor-----you can but give Him the tribute of an humble loving heart. But this He is pleased to accept. Offer it to Him, then, in all sincerity. Converse with Him reverently and familiarly while you have Him in your heart; try to obtain some grace from Him which may remain after He has ceased to be sacramentally present with you and which may enable you to make your next Communion better. Thus you will live always united with Jesus Christ, and by your example and conversation you will edify your neighbor.